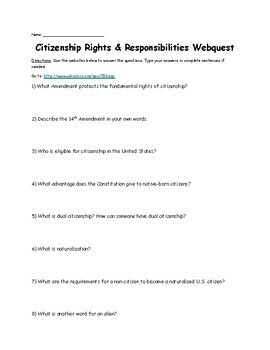 The assignment contains 30 questions about U.S. citizenship and a citizen’s rights and responsibilities. Students will use kid-friendly websites to answer the questions. I have included an answer key. Please message me if you have any questions. *The document can be uploaded to your personal website or Google Drive; however, please make sure it is password protected. Number of immigrants allowed to enter the U.S.